Islander Cruises is the most experienced and highest qualified lagoon tour operator on Lord Howe Island. All tours include Island Commentary with PADI Divemaster and Nature Guide Peter Busteed, quality Mares and Mirage snorkeling gear and morning/afternoon tea. We have something for everyone on our cruise to North Bay, a secluded beach inside the lagoon. With us you will experience stunning views from Mt Eliza, the old Gulch and Herring Pools. Discover seabird rookeries, geology and beachcombing on our guided beach walk. View Coral, Fish and Turtles through our Glassbottom boat as well as an optional snorkel on the wreck of the 'Favorite' with it's diverse coral gardens and tropical fish. Erscott's Hole , Comet's hole Horseshoe reef, Erscott's reef or Stephen's hole. Immerse yourself in the calm sheltered waters of our lagoon, experiencing the greatest diversity of Coral reefs and Fish species available on this 2 hour tour. We are the only operator offering complete daily access to all of the lagoons snorkelling sites from the Southern Sanctuary to the Northern Sanctuary. Explore the underwater world of Lord Howe Island at comfort. Aquascooters are designed for comfort to allow more distance to be covered and they are positively buoyant providing assistance floating on the surface. We are offering a variety of tours to suit everyone from shore, lagoon and offshore scooter tours. 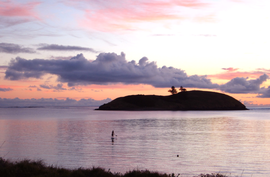 Kayak the Western sea caves or through the Admiralty Islands Arch located off Neds Beach. Join our guided Kayak tour with an option to snorkel the exciting outer reefs. Boat support, snorkel gear, wet suit and Divemaster guide provided. Personalised Photos and Video of your tour available upon request. A 2hr scenic cruises around Lord Howe Island. 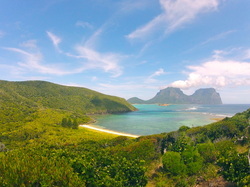 ​What better way to appreciate the vastness of Lord Howe Island than an Around the Island Cruise. This 2 hour scenic cruise includes detailed commentary on the Islands history and geology. Discover our unique marine life, viewing amazing Coral Gardens, colourful reef fish and curious Turtles from the comfort of our Glass Bottom Boat. 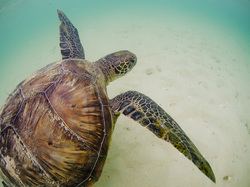 Learn about our resident Green and Hawksbill Turtles and there amazing migration to and from Lord Howe. Tour includes two Snorkelling options exploring stunning sheltered coral gardens with diverse tropical fish life. Relax and arrange a late pick-up at a time to suit you. Fully catered Fish BBQ's available upon request. Enjoy the magic of a Lagoon sunset during our Summer months on our Glass Bottom Boat. Available on request for groups or special events. Explore the lagoon at your own pace and enjoy the abundance of marine life as you explore secluded reefs and beaches. 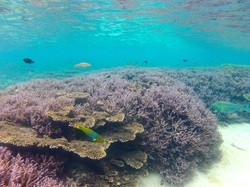 The Outer Reef Snorkel Tour will include travelling outside the lagoon to different snorkelling sites. This is a chance to explore in some deeper water. ​Snorkel Sites include the Front Reef, Malabar and Admiralty Islands sites.​ The site will be determined on the day and the tour will run for one hour. Price includes 3mm or 5mm wetsuit (shorty or steamer), Mask and Snorkel, Fins and a weight belt if required.